This easy weeknight Paleo chicken drumstick recipe is easily the best baked chicken recipe I’ve ever tried! I’m obsessed!!! Update: This is my most popular post ever and I’m not surprised! I just went Paleo again this summer and lost 20 lbs in 6 weeks relying heavily on this delicious, easy dinner. I have no plans to stop now so bring on the chicken! Long story short: I have been battling some major fatigue. I mean, I’m usually your normal I-have-two-kids-tired but about a month ago I started being stuck-to-the-floor tired. I was too tired to leave the house, too tired to get my work done, too tired to do anything even after I started going to bed early and Kyle was getting the kids up so I could sleep in. A friend of mine got an energy boost when she went Paleo using this Paleo cookbook, so I tried it. It’s going pretty well! The bad thing is that the grocery bill got a little unmanageable because it’s a lot more affordable to eat lots of processed starch, so I found myself needing recipes that were cheap, easy, and not on my “bad list”. Which is how I discovered this amazing recipe for chicken drumsticks. Drumsticks are so cheap and I had never made them before because they seemed too challenging, but they’re so easy! I have made no less than 50 of these babies in the last few weeks. Preheat the oven to 400 degrees. Line a cookie sheet with parchment paper. Take the chicken out and lay it on the sheet so none are touching. Coat the chicken either with olive oil or coconut oil and then sprinkle evenly with all seasonings, being sure to start with salt. NOTE: The cayenne pepper is optional because that’s pretty spicy stuff, so if you do use it be sure to use it sparingly. I love spicy, but I’ve wiped myself out on accident before so watch it. Little tip – use one hand to pull the chicken out, coat it, turn it, etc. and the other hand to hold the spices so you don’t have raw chicken germs everywhere. Also, remember not to wash your chicken! That spreads germs! Bake for 30 minutes. Turn them over. Bake for another 30 minutes. Bask in the awesomeness that is this chicken. I have mine resting on some arugula with lemon and sea salt up top, which is my favorite way to eat these. The spices on the chicken end up getting on the salad so it’s dressing without being dressing. I am not a salad lover (not without cream and cheese, anyway) so this is a big thing for me! If you’re thinking about doing Paleo or Whole 30, you might want to check out my post about losing 28 lbs in 6 weeks on Whole 30 during my first attempt. I have been grain-free because of allergies for almost 20 years. Life would be so much easier if I could at least eat rice but nope, can’t do it. This is one of the reasons why WDW is my vacation of choice – allergy chefs! I have done a lot of recipe searching online – best new one is Black Bean Brownies. Gaylin have you tried the chickpea choco chip cookies? They’re pretty awesome also. Love the best ever chicken drumstick recipe . Can it be made with thigh? Yes, it turns out just about the same but you probably don’t have to cook it quite as long. Are there specific measurements for each spice?Thanks! I am very interested in your black beans brownies. Also Grainfree pizza crust. doro3666@hotmail.com thank you. DE. How would we find you on Facebook? Oops, just realized you DO NOT want to get the Everyday Grainfree Gourmet recipe book. Almost all recipes include almond flour. Do you want a recipe for pie crust? Nut free, of course. Ginger cookies? Brownies? Not yet because I’m still completely off sugar and I haven’t been making any alternative sweets because I don’t want to tempt myself. I think my sugar addiction was my biggest problem and I’m not totally over it but I feel like I’m getting close. One of these days, I do plan on working it back in but for now I’m holding out. I’ve been doing paleo for a little over a year now. It really had been life changing. A little change at a time had led to 50 pounds lost, better sleep, less stress and a stronger body. So worth it! The first few weeks were tough, but it gets better! I now eat about 90% paleo, as you said…there are cookies! We have a lot of smoothies, coconut (milk, flours, chips) with everything, sweet potato chips from Costco, lots of raw veggies, lots of bacon and frozen grapes and berries for treats. To stay on budget we get a produce basket for $15 a week, get our dairy delivered from a local dairy and buy our meat from a little farm in Heber- more pricey, but better quality and not going to the store every week keeps our budget in check. This recipe looks divine and we ‘ll be trying it this week for sure! I’m happy to talk about paleo if you have questions! I didn’t know that you were doing Paleo?! It’s great to hear that you’ve been doing it for so long and you’re still into it! I have to admit that I’m coming up on the end of when I thought I’d try this out and I’m kind of thinking I might just keep going. I feel really good! Thank you for all of your budget tips – you need to get your budget blog back up! I wish I could do quinoa – that’s the biggest thing I miss besides steel cut oatmeal. It’s weird since it’s such a health-type food so I almost feel like I “should” be able to eat it, but this current plan says no way. Maybe soon…keep eating your carbs!! Carbs make fat cute babies – I’m pretty sure Calvin is 80% pancakes. I’ve been hearing about Paleo left and right these days. Good for you for trying something to be healthier and less tired! I just wanted to chime in and say that I tried your recipe last night. I didn’t have drumsticks but I had leg quarters (same thing just with the thigh attached) and I followed your recipe exactly. Hubby left the bones completely naked! lol He usually leaves a little chicken on there and I have to get on him about how “chicken doesn’t grow on trees” and how he should finish it all but he says, “I’m full” and I end up tossing some, but not last night! 🙂 I don’t eat the skin so I didn’t get as much of the flavor so I’ll have to re-try this and rub the spices directly under the skin so I can enjoy these more. The drippings/juice at the bottom of the pan were soooo good! No wonder you use it as dressing. We normally just do oil and balsamic but yeah that stuff was so good. 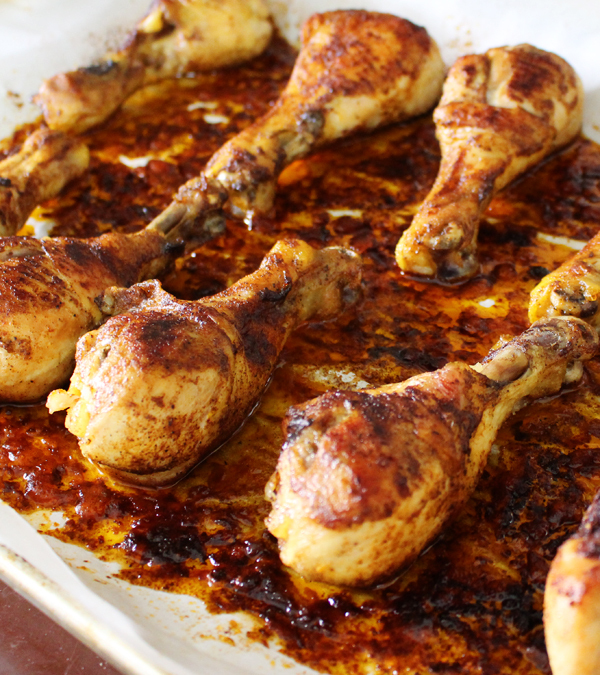 Thanks for sharing this simple recipe and for getting us a little out of our bbq-flavored oven baked chicken rut. Isn’t it so good??? I’m glad you made them – I always worry that I post these recipes and people don’t believe me when I tell them something is extra delicious. I think this chicken might be the best thing I’ve posted (outside of those Guinness cupcakes). I haven’t tried it on leg quarters but that’s a good idea! If you do it again, maybe you could just take the skin right off before you season? Some of the drumsticks show up without skin and once they’re all baked I really can’t tell the difference. Thanks so much for this awesome recipe! Please share more budget friendly paleo ideas like this one!!! I need to say, that chicken made the whole house smell so good too, we were drooling within 15 minutes of them going in the oven. Oh, I’m so glad! Definitely one of my favorites. Thanks for letting me know! Trying this tonight and I agree it’s been in about 9 min and it already smells crazy good! I’m going to try the bed of greens but kale since that’s what I have on hand! Tried your chicken leg recipe yesterday and loved it. It was simple and fast! Great! Thanks for letting me know that you liked it!! Hi there! I’ve made this chicken a couple times now and it is so delicious!! Thanks so much for sharing the recipe. I’m wondering if I can get the same result from using foil instead of parchment paper, I am out at the moment but want to make this for dinner. . .
Hi, I have added these to my meal plan for next week and hoping they turn out as yummy as they look. This might be a silly question (pretty sure it is!) but just to be sure, do you season on one side of the chicken only or turn over and season the other side too before putting in the oven? Thanks so much, i just don’t want to mess it up! I season both sides before I put it in the oven. Hope you love it! I am making these for the second time in a week! SO GOOD! Thanks for the idea! Thank you for this recipe. My family loved it!. So simple but yet very flavorful. I will definitely be making this one many, many times. The cinnamon is seriously the secret ingredient! I skipped it once and the chicken was really boring in comparison. Glad you liked it! How much of each spice? Sorry for the slow response! I really just eyeball it and cover the chicken pretty evenly with each spice EXCEPT the chili powder because I’ve done that on accident before and it’s way too much. I think it’s a matter of personal preference so I would say just try to keep it even between the spices and go easy on the chili. I just read your reply about chili powder but it’s not listed as an ingredient. Is chili powder supposed to be an ingredient for the chicken legs? Thank you for catching that! I meant the cayenne powder. Sorry, we’ve been using chili powder instead because we’re out of the other and I’m lazy. I don’t often leave comments but just wanted to say I really love this recipe. I’m pretty new to paleo and a bit fussy but this recipe is really delicious. Skin turns out nice and crispy…first time I’ve eaten the chicken skin in years. Thank you! Thank you, I’m glad you love it! These are awesome! We’ve made them several times now, and even our 6 year old likes them. Thanks! Made this tonight and wasn’t sure of the ratios so did (for 4 drumsticks): 1 tsp garlic powder, 1 tsp paprika, 1/2 tsp cinnamon, 1/4 tsp cayenne pepper. Pepper was liberal. Salt was sprinkle on the drumstick. Mixed all except pepper in a little container and sprinkled over the drumsticks after sprinkling the with salt. The hint of cinnamon was fascinating! This made for a delicious chicken with crispy skin and juicy meat! I’m glad you liked it! Thank you for sharing the amounts – I’ve had people ask but I always eyeball it so I’m not helpful at all! I like your idea of premixing…we make this often enough, it would be worth it! You mentioned using chili powder but I didn’t see it in the recipe above. The chicken was great without it but I’ll try adding it in next time. Very good but didn’t like the cinnamon. Cooked on wire rack halfway through so they were super crispy! I’m glad you liked it and thanks for being honest about the cinnamon! You’re the first I’ve heard that from! Knowing the measurements or ratios that you used in your recipe would be helpful! Thanks for sharing your recipe though, trying it tonight. CrossFitting male here who decided to let go of meals delivered, to try my hand at really controlling what goes into my body. I can cook, however, I let laziness take over, so the majority of my meals were prepared for me. Last week I decided to save some coin and try my hand at cooking. Chicken is the athlets best friend, and I sure love drum sticks. I whipped this up last night and didn’t try any until today, for lunch; two legs, atop one cup of fresh spinach. I was a little nervous but have to say that WOW this is GREAT. Thank you SO SO much for sharing some kitchen tips to the world. Now I’ve got to check your site for other chicken meals. all the spices – antioxidants! – make your drumstick recipe extra healthy! Such a yummy dish! Thanks for posting it! I used chicken thighs, convection roast at 400 degrees. 30 minutes on one side and 15 minutes on the other. So nice and juicy….and such a quick meal to throw together. So glad you liked them! I’ve never tried it with chicken thighs but I will now. These are in my oven baking right now and holy wow does that smell AMAZING! You are so right about the cinnamon, so glad I didn’t skip it! It’s not an ingredient I would have thought to add, but I’m sure it’s going to add a wonderful dimension of flavor to the dish. Just finished a few of these and I must say, pretty incredible. I will make them again. Probably often. Thank you for posting the recipe! I just made this tonight and they were delicious! I ate them with salsa, half an avocado and cabbage. There is enough left over to eat tomorrow. Yum. What exactly are the measurements of the dry seasonings? You weren’t kidding. BEST CHICKEN EVER!!! I made two batches of 12 in two days. One for a potluck and my family got so mad I had to take them, I made more for them the next day. Thanks. These will be a staple. That cinnamon is EVERYTHING!!!!! The combination of these spices on chicken is SO good! I used boneless, skinless chicken breasts (bc I already had them thawed & someone shared this on my gym’s challenge page today, & I immediately knew what I was doing with that chicken). 400° for 20 min, no turning, gives you perfect b&s breasts. I used foil & oiled the sides around the chicken, and then threw on some butternut squash, cherry tomatoes, & broccoli (rubbed all sides in the oil) to roast along with my chicken. Threw the veggies on top of mixed greens with a drizzle of avocado oil & a little lemon juice, & had the chicken on the side. Heaven. Thank you for a wonderful recipe! I just had to thank you, I have used this recipe since last year and my fiancé LOVES it!! Our once boring chicken dinners are no more! Thank you for this simple but amazing tasting recipe! Your symptoms in the article sound familiar… I was diagnosed with low thyroid about 4 years ago. Gave up sugar caffiene and gluten and by God’s Grace I am healed! This was so delicious!! And with such minimal effort! Thank you for this! Yes, cinnamon = so important! I’m glad you like it and that you’re sharing it! Hey there, great recipe! I’ll be using it tonight. Just a little tip, I noticed you’re using EVOO. My hubby pointed out to me that research shows you should not use EVOO for cooking with heat. It destroys the healthy benefits and turns the oil carcinogenic. I started using the more refined olive oil from Costco after I learned this. I reserve EVOO for uncooked food like salad dressing. I had never heard this before – thank you! Myth. There is no research to substantiate this claim. Someone selling oil at a farmer’s market told me this last week and it got me to thinking. One, it doesn’t make any sense chemically given the high smoke point of EVOO, and second, there isn’t a high instance of cancer on a Mediterranean diet which consists largely of EVOO for cooking. There is evidence that suggests if you were to reheat EVOO repeatedly for cooking that this could be the case. How much of everything do you use? That “All Natural” Tyson brand chicken though. VERY NOT PALEO!! This 55 year old has never baked drumsticks before in her life until tonight! Delicious barely describes these babies! So moist and flavourful and yes, the cinnamon puts them over the top. I made these tonight and they were amazing!! I was wondering though…how do you think they’d turn out on the grill? My house was so crazy hot after I made them, but I want to make them again this weekend when we have family over. I’d be curious to see but we don’t own a grill. Sorry I couldn’t help! I have been on both Paleo and Whole 30, the Whole 30 worked best for me…..I miss tomatoes…..I can’t have any night shades, hot spices…..I miss those. But I LOVE when I find a recipe that I can use and my family will love!!!!! I was type 2 diabetic, on the whole food, plus herbs from my doctor, my blood sugars are NORMAL….!!!!! I will be on Whole 30 for life….I miss most agave in my tea in the morning…so I don’t drink the tea anymore……thank you for sharing recipes that I can use!!!!! This sounds awesome! I will be trying them tonight! An hour for drumsticks sounds like a long time, though?? People have written in and said they did just 20 min on each side and it was fine but I always get nervous about undercooked chicken. If you make these in less time let me know if they worked! This sounds like a great recipe and I found it when searching Pinterest for chicken leg recipes! I’m going to make it tonight. However, I will never buy Tyson products because I have seen firsthand the horrors of their ‘factory farms’. I now will only buy and serve for my family organic (no antibiotics), free range chicken. When I saw this post, my first reaction was to Tyson chicken, too. Horrible, horrible company. I feel so bad for their animals. I was looking for a quick, Paleo-ish recipe for drumsticks and found this. Being the impatient person that I am, I cheated. I got two ziploc bags – put oil in one and all the seasonings in the other (no cayenne!). 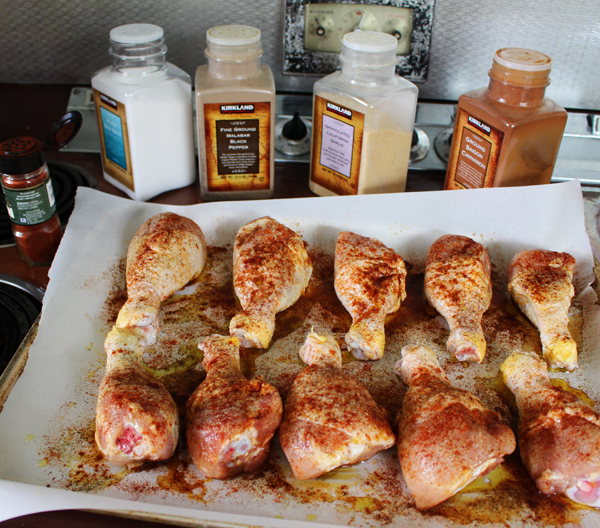 I put each drumstick in one at a time, coated with oil, then with seasonings – boy did they get completely coated! I was worried I’d end up with too much, but all were uniformly covered. Just got them out of the oven and devoured two – saving the other 3 for lunch/dinner later in the week (I’m single – my leftovers never taste good so I’m keeping my fingers crossed on this one!) Need more recipes that work for one person. I made this yesterday – what a hit! I’m doing Whole30 to try to get my Rosacea under control, and I have to find dinner recipes that the whole fam can eat and won’t kill the budget. I have a husband, two college-going sons, and a toddler (baby surprise! ), and they EAT. I cooked 28 in two pans, and it lasted for two dinners and a couple days worth of lunches, as well – a miracle. Love this!! Is there actual measurements for the spices, or just some here, some there? I make this recipe pretty often so I put the spices together into an empty shaker so it’s easier the next few times. I do that with a lot I’d recipes actually and it saves me tons of time. 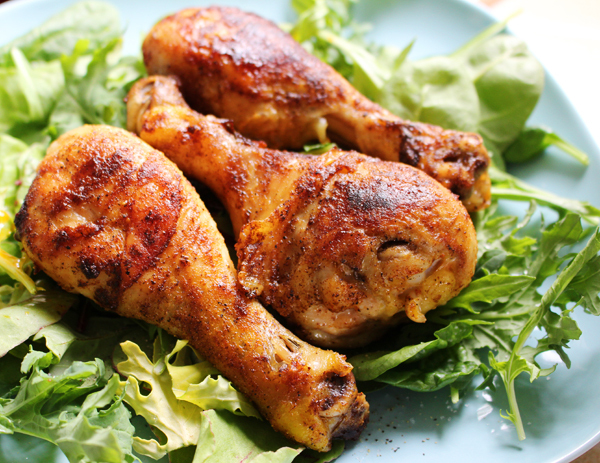 I also make this recipe with chicken thighs vs drumsticks and it turns out great. Um hello, this was SO yummy!! And EASY PEASY!!! Thank you!!! This seems like a REALLY long time to cook chicken drumsticks… 1 hour at 400F!? Do they not come out dry? I’m inclined to cook them 20 per side for a total of 40 minutes. Slowest reply ever so I hope you tried the recipe and it worked for you at whatever time! Other people have mentioned that they thought that was too long and I always figured I just really like my chicken “done” but it’s also possible that my incredibly old (think sixties) oven is so inconsistent that it’s not cooking the chicken as much as yours might be. Room to experiment! Have used this technique many times and love it! I put the chicken on a rack over a baking sheet so the skin can get nice and crispy! I have made this recipe twice and am making tonight on the grill. My sons not only gave it the thumbs up they gave it 20 fingers/toes up. I get hugs after making this recipe. Thank you and I will report back about the hopeful success with the grill. Looks fantastic- great tip about the greens underneath- I will have to try that! I did what another commenter did: I mixed this up and put it into an empty spice-container shaker. I mixed up more than I needed to have on hand for next time, which is how I usually do it. I added 2 t. salt, 1 1/2 t. pepper, 2 t. garlic powder, 2 t. paprika, 2 t. cinnamon, a few shakes of cayenne, and a few shakes of smoked paprika. (Obviously, this can be adjusted to one’s own family and preferred flavor combination!) I find it easier to shake from just one container and recommend trying it this way. As always, it was delicious and easy. My kids, who are 7 1/2 (and a solid eater) and 4 1/2 (and a picky eater) both really like it, which is a win. (To address someone else’s comment: One hour really is the right time for these; I’ve tried it in our own old oven and a nicer oven at someone else’s house – it would overcook chicken breasts but is just right for legs. According to Serious Eats – see http://www.seriouseats.com/2010/05/how-to-roast-a-chicken-butterflied-tips.html – it’s because the connective tissue in legs must get to a higher temperature to get tender, and because there’s collagen in the legs, which gets turned into gelatin at a higher temp., which also helps keep it tender.) Thanks so much for sharing, Carly! Thank you for leaving the measurements!! I liked the shaker idea but I was too lazy to try to figure out how to get the flavor right. I’m glad your kids like it, too – I have two picky eaters so I’m familiar with that battle. These came out SO GOOD! I am super picky about chicken and was impressed how easy and delicious these were. I loved the oven method and the combo of spices– I am also a huge fan of cinnamon on chicken and love that it was included here. Thanks! The recipe I’m looking at has no measurements for the spices! Can someone point me to how much of each spice to use for this chicken, because I want to serve it tomorrow night for dinner!! Super yummy, thank you! Entire family gobbled it down and asked me to put it into rotation. Recipe and cooking instructions were spot on. Very easy, low effort, next to impossible to mess up and great flavor to boot!